Daniel Ticktum (Arden Motorsport) and Gabriel Aubry (Tech 1 Racing) are the race winners of the Formula Renault 2.0 Eurocup weekend at Hungaroring. Ticktum triumphed in Saturday’s Race 1, what was his maiden win in a series. Aubry also scored his maiden win on Sunday morning, repeating a success with one more victory on Sunday afternoon. Daniel Ticktum started from pole in saturday’s Race 1 and converted the best starting position into maiden victory. 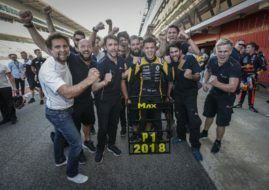 He won ahead of Sacha Fenestraz (Josef Kaufmann Racing) and fellow Red Bull Junior Team driver Neil Verhagen (MP Motorsport). The championship leader Will Palmer (R-ace GP) finished 18th, remaining in the lead but just three points ahead of Robert Shwartzman (R-ace GP), who was seventh in Race 1. 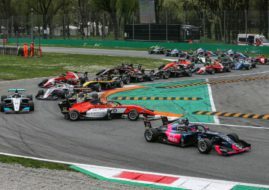 Sacha Fenestraz and Gabriel Aubry started from the front row in Race 2, ahead of Will Palmer and Max Defourny in the row 2. In the opening lap, Aubry and Palmer overtook Fenestraz. Such an order remained the same until the end of the race, with Aubry’s built an advantage of 4.710 seconds over Palmer. For the Race 3, Aubry secured a pole position ahead of Sacha Fenestraz and Robert Shwartzman. Aubry defended his lead on the start, losing it on Lap 4 to Sacha Fenestraz. However, Fenestraz earned 10sec penalty because of false start, so he dropped to P8 at the end of the race. Aubry took his second win in a row, ahead of Robert Shwartzman and Max Defourny. After five rounds and eleven races, Will Palmer is still in a lead with 174 points on his account, five more than Robert Shwartzman. Sacha Fenestraz (152 points) is third, Gabriel Aubry (114 points) progressed to the fourth place. 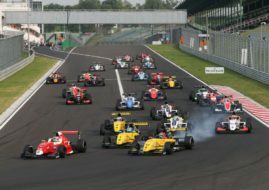 The sixth round of the Formula Renault 2.0 Eurocup is scheduled for July 15-16 at Nurburgring, as a part of the FIA WEC weekend.